How can the greatest player of all time be the second-greatest player of his own time? For years now, tennis fans have had to wrestle with this paradox as Roger Federer has gone down to defeat after bludgeoning defeat at the hands of Rafael Nadal. Yesterday's French Open final followed an all-too-familiar pattern, yet the match commentators still reflexively used the "greatest ever" tag whenever a Federerian epithet was called for. But of the handful of players from the recent past who could be considered candidates for the honor, have any been as comprehensively owned by their most formidable rival(s) as Federer is by Nadal? Laver bested Rosewall; Sampras edged Agassi; Borg, Connors, Lendl, and McEnroe fought one another to a collective draw. 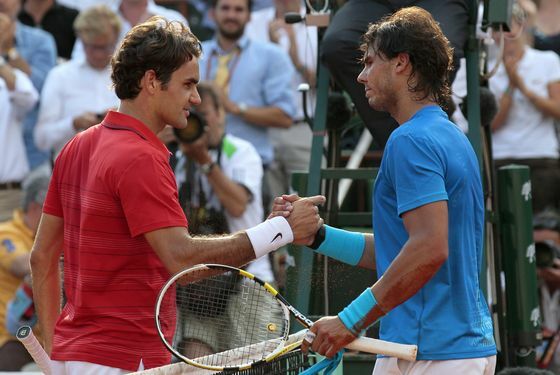 In their head-to-head matches, Nadal has won seventeen, Federer eight. Nadal has now won six of their eight Grand Slam final showdowns. Yes, but take away the overall results on clay (Nadal, 12–2), one argument goes, and the Fed emerges with a 6–5 edge on grass and hard courts. But Nadal, crucially, had to go through Federer to win a Slam on grass, Federer's fiefdom (en route to his first Wimbledon, in the greatest match of all time — no quotation marks needed there), whereas Roger's sole French, c'est triste, mais c'est vrai, is his only because he never had to face Nadal. Nadal, moreover, won their only hard-court Grand Slam final, the 2009 Australian. If any further proof were needed, there was the 2007 "Battle of the Surfaces" exhibition match, played on a specially constructed hybrid court with grass on one end, clay on the other. Guess who won? The truth, I suspect, is that we keep saying Federer is the best ever because we need it to be so. We need to believe in the triumph of the beautiful, that the grace he embodies isn't merely incidental to his success. Because tennis, even as it appears forever on the verge of degenerating into mere athleticism (cf. the joyless gruntfest that has been the women's game of the past half decade or so), can never quite escape its subtle relationship to art — to sculpture, say, even to dance. (Attending a tennis match is even a little bit like going to the opera, what with the hushed deportment.) Nadal's two-handed backhand, so powerful that Federer once said it was like facing someone with two forehands, could never be called beautiful. But the majestic sweep of Federer's increasingly anachronistic one-hander, so ruthlessly victimized by Nadal's tsunamilike topspin, has the drama of a grand gesture. In this dialectic tennis resembles soccer, where greatness can be achieved via mere winning (Manchester United) but immortality is reserved for those who win the beautiful game beautifully (Barcelona). So those who insist on Federer's primacy in the pantheon, in spite of the mounting evidence to the contrary (yes, he's won the most-ever Grand Slams, but Nadal could render this a formality in no time), are perhaps pointing to something beyond sport. They are haunted by the ideal. They are the tennis Platonists. Long live the paradox.